A.M. Ran with Jeff. First 10.1 in 1:09:09. Then ran 0.35 with Sarah and the rest alone. Saw that I was behind the 7:00 guy by 25 seconds with 2 mile to go and decided to beat him with the minimal casualties. Ran a mile in 5:56 to make him give up, then jogged the rest of the way. 1:44:42 for 15 miles. Did some more limb measurements with Jeff. Was about an inch longer than him in the thigh length as well as the shin length. In the earlier measurements my quad was an inch bigger in circumference in the widest part. We measured the narrowest part near the knee. I was 15.5 inches, he had only 13.5. I think we finally got to the reason why my quads look so big. They are actually rather normal width for the length of the thigh, but unusually wide in the lower thigh by the knee. My vastus medialis looks a lot bigger than Jeff's. P.M. 1.2 with Julia to the park in 12:00 with Benjamin and Jenny following on their bikes. 1.5 with Benjamin and Jenny running in 12:58. Then 2.35 in 17:41 with Benjamin and Jenny on their bikes in the last 1.2. Five Fingers - 410.24 miles. A.M. Ran with Jeff and Josse. Jeff and I did an interesting workout. The target was to go 73 seconds per quarter until I could not hold the pace, then once the failure became obvious finish at the closest quarter mark. The first quarter was right on target - 73. On the second one Jeff put a bit too much pepper on my plate - 70. No wonder it felt so hard - I began to think wow, my anaerobic capabilities are so bad that I can barely make it to 0.5 doing 73s? Hit the 0.625 mark (a bit over 1 K) in 3:00, that was good. Then 3:37 at 0.75 (74). Around that point I started falling apart. No heavy legs, just all of a sudden cannot go, and do not understand why. That was not good. Next quarter was 78, stopped at the mile in 4:55. What was interesting about the experience is that the boundary between, well, I can do this for a while and no this is not sustainable for more than another quarter was very thin. Which is expected when you do purely aerobic training, and is actually good in the marathon because the moment you start running too fast it hurts enough to alert you to the problem. With some anaerobic training I could of course train myself to sustain 73s for longer. But that would do me no good in the marathon. I want to be more aerobic at that pace, and sufficiently aerobic at 5:00 pace to make it through the 5 mile tempo. How do we do that? Big mystery, exciting mystery. Here is an idea - find out a way to shut down the anaerobic gear without shutting the nervous system down with it, and do some high volume speed work as fast as the aerobic gear will let you. For the rest of the run we ran easy with Josse and had her do 2x100. She did the first in 16.4, and the second in 16.6. Dropped Josse off, went around the block twice while Jeff went to the bathroom, then ran another 4.25 with Jeff. Total of 15.05. P.M.1 with Julia in 9:55, 1.5 with Benjamin and Jenny in 12:55, 2.5 alone in18:29. Five Fingers - 415.29 miles. A.M. Ran with Jeff and Daniel. Daniel went 10.1, Jeff ran 14.1. I added another mile. Total of 1:55:55 for 15.1. 0.8 of marathon pace is due to VPB intervals. Jeff has been officially appointed as the chorister and the lead singer in Van1 for the performance of Bingo on my legs. We practiced a bit today trying to figure out the appropriate beat frequency. P.M. Errand jogging - 0.5 miles. 2.5 alone in 18:25, 1 with Julia in 10:49, 1.5 with Benjamin and Jenny in 12:57. Five Fingers - 435.39 miles. A.M. Started with Daniel. About 3.7 into the run we caught up to Luz and invited her to join us. Paced her through a mile in 8:02. Then she did not slow down much after that, so we just stayed with her for the whole 8. She ran with us all the way to my house, which gave Sarah a training partner to run as well afterwards. Total time for 8 was 1:06:18. A bit later a mile with Julia in 8:46. P.M. 2.5 alone in 18:07, 1.5 with Benjamin and Jenny in 12:53. Five Fingers - 447.39 miles. A.M. 2.5 in 17:29 by myself, 1 with Julia in 9:46, 1.5 with Benjamin and Jenny in 13:07. Five Fingers - 452.39 miles. P.M. Ran leg 5 in 47:59. Details to follow. Now the details. BYU finally put together a real team. Good for us. Will hopefully teach us to be humble, and will hopefully help us get a better appreciation for Quality X and the importance of developing it if we want to run in the OTQ range. Before the race James and Cody entered some data into Paul's spreadsheet. Whatever came out was called the original projection. I adjusted the flat places, made a few adjustments to the calculations and then went through it leg by leg and manually adjusted the predictions that I felt were still way off to more reasonable values. The new projections were called Sasha Science projections. Interestingly enough, the original projection said we would finish in 17:39:35, while Sasha Science said 17:39:38 - essentially the same end result, but lots of leg time variations. Both ended up quite a bit off, although for different reasons. First leg. Jeff McClellan on the White Team, Mitch Zundell on the Blue Team, Kyle Perry on the BYU team, and Mike Vick from Runner's Corner. 90-95 degrees at the start. To add a little bit of drama - Jeff ran for BYU before his mission as a walk-on, then after his mission got cut. So he had something to prove. He hit his first mile in 5:05 (uphill), followed by 5:18, 5:27, 5:53 (uphill), 5:53 (uphill). He finished his leg in 28:28 which was 5.14 miles, 5:32 average. Not bad for uphill (0.2 grade, 132 feet of loss, 192 feet of gain) and 90 degrees. 26:32 for Kyle, 27:42 for Mike. His Sasha Science projection was 29:08. The original projection was 31:00. Mitch finished in 29:40, very good for being out of shape. Another reminder of the importance of Quality X. Second leg. Hayden Hawks on our team against Nate Ogden (BYU) and Jared Kelly (Runner's Corner). Hayden struggled with the heat but still managed 39:44 for 6.73 miles, 5:54 average. Not bad for 90 degrees and 0.7% net uphill grade with 292 feet of gain and 192 feet of loss. His Sasha Science projection was 39:30, his original projection was 41:19. Jared ran very well and gapped Hayden by a couple of minutes. Probably about the same gap for Nate. So we were about 4 minutes behind BYU at this point. Third leg. 5.65 miles. 0.3% uphill, 42 feet of loss, 275 feet of gain. Iain Hunter for BYU, a girl for Runner's Corner (UVU runner, I think), and Tyler for us. Tyler started out as expected, first two miles at 5:45 pace. Passed the Runner's Corner girl, after that we never saw Runner's Corner. Then a 5:57, and then something really odd happened. 6:24, and 6:45. This should not have happened even in 90 degrees and dehydrated. Maybe 6:10 and 6:20 at the very worst. I told him he needs to eat like a heart patient, lots of fiber, very minimal to no cholesterol. Something somewhere is wrong. Tyler toughed it out and finished in 34:42, 6:08 average. His Sasha Science projection was 33:30, his original projection was 34:43. After he was done he headed straight for the Honey Bucket. I got into one right next to him to address my own needs, and we had a lovely discussion of his leg. On the positive side, he made the first road kill, or in other words, passed a team that started earlier. I thought a fluke, somebody must have gotten a wrong start time, but then there was more road kill on the legs to follow. Forth leg. 5.09 miles. 0.6% uphill. 315 feet gain, 152 feet loss. Walter Brown on our team against Aaron Robison (BYU). Walter got 31:27, 6:10 pace, Sasha Science projection was 31:37, original was 31:20. Splits: 5:21, 5:45, 6:00, 6:10, 6:22. Cody ran 31:48 last year. Who knows how far behind BYU. Fifth leg was mine. Avon Pass. 7.41 miles. 2.9% uphill. 1210 feet gain, 54 feet loss. I enjoyed every one of those 54 feet. Ran against Jon Kotter. He showed me what Quality X was all about with a 43:44 against mine 47:59. Sasha Science projection 48:40, original 49:30. Splits - 5:56, 6:13, 6:35, 6:21, 6:33, 6:58, 7:22, next quarter in 1:37 (6:28 pace), last 405 feet in 0:27, 5:56 pace. The leg showed as 7.33 on the GPS. Possibly because of the GPS error, or possibly because I did my tangents very well. 6:33 pace if the GPS was right, 6:29 if the 7.41 distance was right. Paul ran 46:17 last year. There were some interesting things on that leg. There was a farmer, had a dog, and BINGO was his name, and he was roaming along the road without a leash or an owner in sight. I was in racing mode, and it was a small dog, so I figured if it attacked me I'd give it some James MonaFlash treatment. Passed it without an incident. More road kill than I expected. Interesting team vehicle - a pickup truck. Actually not a bad idea, makes sleeping easier. 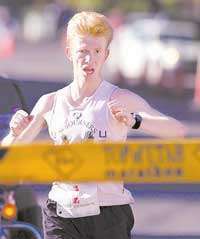 Jeff McClellan demonstrated his singing ability while running at a pace that would make most people throw up. Talents are meant to be shared, and I've been making him practice, so cannot let that go to waste. He sang BINGO to me as he handed me a large bottle of Powerade and ran with me as I took a few sips so he could take it back. Overall I felt strong, got into good rhythm, used the measly 54 feet of drop very well, the gear box worked when I had to shift. Error analysis: we should have put Clyde on leg 5, me on leg 6, and Jeff on leg 12. Iain Hunter told me the gap now was 12:44. I thought it was a compliment to our team that they bothered to time the gap. A.M. Wasatch Back continues. Leg 17 in 36:43, and Leg 29 in 20:18. Details to follow. The end of the first shift of Van 1 was followed by a logistical mistake. Instead of getting our rear ends into Kimball's Expedition and hurrying over to the next exchange to sleep we lounged around, and then followed Van 1 of the Blue team to Subway. Mental note. Next time find somebody ideally in Huntsville, less ideally but still good in Eden or Liberty that would not mind having six stinky guys + the driver come and crash at his house. Sleep is critical to success on the second and third legs for everybody, but particularly to the neurologically limited runners, which in my estimate would be about half of our team. We hurried over to the next exchange, dropped Jeff off in a hurry, dealt with a traffic jam. I am sure glad Jeff is as disciplined and detail oriented as he is, or we would have miffed that exchange. It was dark, lots of teams, you could not see one's face well enough to recognize it. I did not recognize Jon Allen from 5 feet away. He said, how is our team doing? My answer was, "which team? ", with the implication of - why in the world do you expect me to know how your team is doing? I do not even know who you are. Mental note for the future. On the van-to-van hand-off, the first runner in the next van must carry a watch with precise time (or at least now exactly how much off his watch is), and must make sure he is at the exchange at least 5 minutes prior to the time estimate given by the previous van in case a miracle happens or the previous leg turns out to be short. Cell phones sometimes do not work. However, the arrival time is fairly predictable, at least the earliest physically possible arrival time. After that deadline, no potty visits, strides, or anything. Stand there, listen with both ears for the team number, and stare like a hawk at the arriving runners. A volunteer could easily miss a Fast Passing Runner, especially in the dark. Van 2 brought us the baton about 2 minutes behind schedule. Leg 13. 8.47 miles. 3.2% net drop. 712 feet of gain, and 2128 feet of drop. First mile uphill, the rest steep rolling down. Jeff McClellan against Kyle Perry. Jeff's splits speak for themselves - 6:35, 4:54, 4:53, 5:06, 5:22, 5:05, 4:50, 4:53, and 4:50 pace for the rest of the leg. 44:05, 5:12 average. Sasha Science projected 44:59, the original projection was 45:20. Kyle Perry (BYU) ran 43:33. Sweet for Jeff, only 32 seconds behind the BYU super-runner. We were 16:54 behind after leg 13. Leg 14. 3.00 miles. 85 feet of drop, 145 feet of gain. Hayden Hawks against Nate Ogden. Hayden ran 16:22, 5:27 pace, was projected to run 16:34 by Sasha Science, 17:40 originally. Hayden's form reminds me of Ryan Hall. Who knows, he might run 2:06 marathon when he grows up, I would not be surprised. Jared Kelly ran this leg in 16:00. No data on BYU times from this point. Leg 15. 4.95 miles officially, measured 5.05 on the GPS. 208 feet of drop, 265 feet of gain. 0.2% climb. Tyler ran through a side-ache in 29:02. Sasha Science projected him at 28:45, original projection was 28:32. Average Garmin pace 5:45, if the leg was right, then 5:51. Leg 16. Officially 3.05, measured 2.93 on Walter's Garmin. 31 feet of drop, 74 feet of gain, 0.3% grade. He ran it in 17:02, 5:48 pace. Sasha Science projection was 17:31 (5:44 pace), the original projection was 17:46 (5:49 pace). The projections assumed 3.05 miles. Splits: 5:40, 5:57, 5:48 pace for 0.93. Leg 17. Officially 5.87, measured 6.03 on my Garmin. 103 feet of drop, 339 feet of climb. 0.8 % grade. Started at 12:33 AM. Felt sleepy and weak on this leg. Ran 36:43, 6:06 average pace. Was projected to run by Sasha Science in 34:18, 5:51 pace. The original projection said 34:23, 5:52 pace. Splits: 5:46, 6:06, 6:08, 5:56, 6:07, 6:31, and 5:55 pace to the finish. It is interesting to compare my splits with Chad's who ran the same leg: 6:09, 6:05, 6:03, 6:00, 6:07, 6:23. So in other words, in the first mile I was myself, from 2 to 5 I became Chad (in his current shape), and on the last mile I was transformed into a runner that is 8 seconds a mile slower than Chad. This was a clear case of neural fatigue. Next year we'll try Operation Huntsville Nap and see if that makes a difference (assuming I am in Van 1 again, which I should be because it would be a disaster to put me in Van 2). I was rather surprised that I was passing mostly fit looking young men running around 7:00-7:30 rather than mostly women running 10:00 pace as I was expecting. Every time I'd come up on one due to my past race experience (you never start behind somebody except a race like this) I would think, well as weak as I am feeling, he's going to try to hang with me. Maybe I'll draft a bit before passing him. But he never did try. Of course, he could not. If you did not even see him a mile earlier, there is no chance he'd be able to go with you. It is like passing somebody who's hit the wall in a marathon. He is a helpless lamb, there is nothing he can do. My mind was playing tricks on me in the middle of the night. Leg 18. Officially 5.23 miles, measured 5.11 on Jeff's GPS. 201 feet of drop, 695 feet of climb. 1.8% grade climb. Jeff Shadley with his quads already trashed ran 34:40 averaging 6:47. His Sasha Science projection was 33:48 (for 5.23), 6:28 average. Original projection was 32:48, 6:16 average. We messed up the exchange. It took about 30 seconds for Taylor to find Jeff. Again, a note for the future. We need military discipline in the vans, especially at night. Know the current time, know the earliest your hand off can arrive, and from that time on watch like a hawk without losing vigilance. The runner ideally should never be left alone at the exchange. 5 minutes from the earliest possible arrival the companion should come out and be there to remind the runner to stay vigilant. Immediately after picking up Jeff we headed over to the North Summit High School in Coalville. Set a PR for the sleep. 70 minutes! This later proved very helpful on the third leg. Being humbled by the hand-off fiasco we were more disciplined. However, we did waste about 5 minutes on a small detail. I forgot the exact location where Tyler and Walter were sleeping, and it was impossible to tell among about 50 sleeping bodies in the dark who was who. So we did a man to man check waking up a few unhappy runners. Some volunteered that they were not either Walter or Tyler before we had a chance to kick them. Note for the future - make sure you know EXACTLY where everyone is sleeping and can find that place in the dark. For the team members - do not go away from the van without telling the van captain (and have an official van captain to begin with) where you are with enough detail that he could find you in less than 60 seconds in case of emergency. Drove over to the Rockport Lake for Jeff to start his leg. There was a huge jam. We let Jeff out with about a mile to go so he could do his warm up. Leg 25. 5.60 miles. 385 feet of gain, 155 feet of loss. 1.3% grade. Nasty leg. I ran it last year. Slower than it looks from the elevation profile. Jeff McClellan started his leg at 5:01 AM, about 3 minutes behind Carson Campbell from the Peak Endurance team that started at 4:00 PM, an hour before us. Too much gap for Jeff to make a road kill, but enough to set Hayden up for it. Jeff's splits - 5:34, 5:50, 6:01, 6:30, 6:29, next 0.5 in 2:47, last 509 feet at 5:18 pace. Total time 33:42. Average pace 6:01. The original projection was 33:51, Sasha Science projection was 33:49. Kyle Perry reported that he ran that leg at 5:56-5:57 average. So that puts Jeff at most only a little over 30 seconds behind. Jeff finished about a minute behind Carson. We again lost about 3 seconds on the exchange. This time we did it right for the most part - I was out there with Hayden and kept him alert. But then we both spaced out spaced out, Jeff apparently went by the radio announcer so fast he could not see his number, either that or Hayden and I both spaced out, the volunteers kept us out of the exchange area until the number had been announced, and by the time Jeff got in Hayden was still on the sidewalk. Again shows the importance of being vigilant. Leg 26. 163 feet of gain, 127 feet of loss. 0.1% grade climb. Leg 29. I started at 7:05 AM. Splits. 4:52, 4:36, 4:56, 5:30, last 379 feet at 5:40 pace. Average pace 4:59. P.M. Home to Costco relay with the kids. 1.06 with Julia in 10:48, 1.56 with Jenny in 13:51, and 2.75 with Benjamin in 22:55.